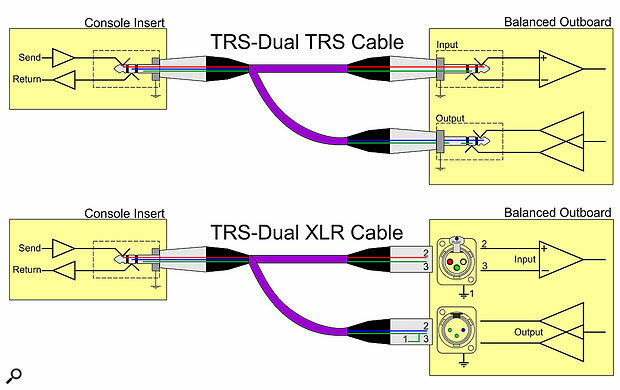 If you’re handy with a soldering iron, a typical Y-cord insert cable can be adapted to connect balanced outboard gear to your mixer’s unbalanced TRS insert point, as indicated on the diagram. I’ve read that pro gear should use balanced connections, but I’ve been looking for a mixer recently and find that most have unbalanced insert points. My interface uses balanced inputs and outputs, as does most of my (modest collection of) outboard gear. What gives? SOS Editor In Chief Paul White replies: Many mixers offer unbalanced insert points as it’s convenient to use a TRS jack to handle both the send and return signal. It also saves on balancing and unbalancing circuitry inside the mixer. In most cases, the unbalanced cable runs connecting the external gear are short enough that interference won’t be a problem, especially as the signals are at line level, although there’s the possibility of increased hum due to ground loops. This issue is caused by having multiple ground paths between equipment, due to having both mains power grounds, and the unbalanced cable screens on connecting cables also being ground conductors. In reality, this is not usually a significant problem, though if you were to actually measure the hum level using sensitive test equipment, it is likely that it would be higher in an unbalanced system even if still inaudible. In the event that ground-loop hum is evident, some improvement can be achieved by making up special cables to connect the insert points to your patchbay or external equipment. SOS Technical Editor Hugh Robjohns adds: Paul mentions making some ‘special cables’. It’s worth mentioning that this sort of DIY job needn’t be daunting! 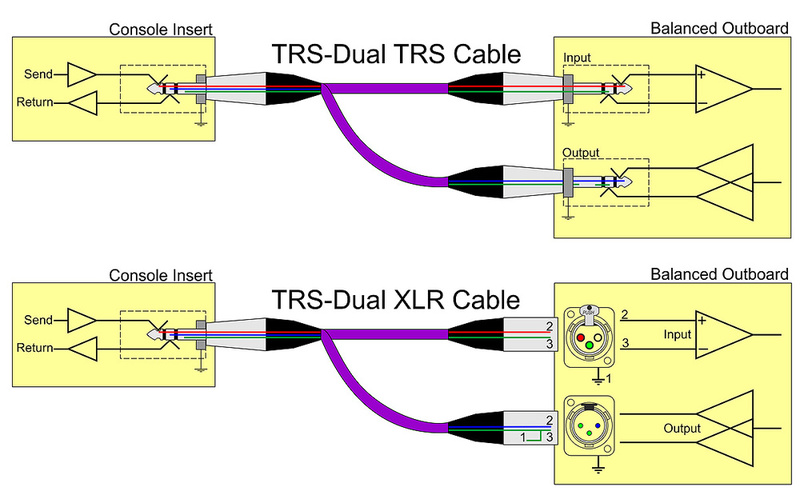 With that in mind, here’s a diagram (above) which should help anyone wanting to adapt a TRS to 2xTS or 2xXLR insert cable to allow balanced gear to be used with an unbalanced single-socket insert point.